I get so festive during this time of the year guys ! 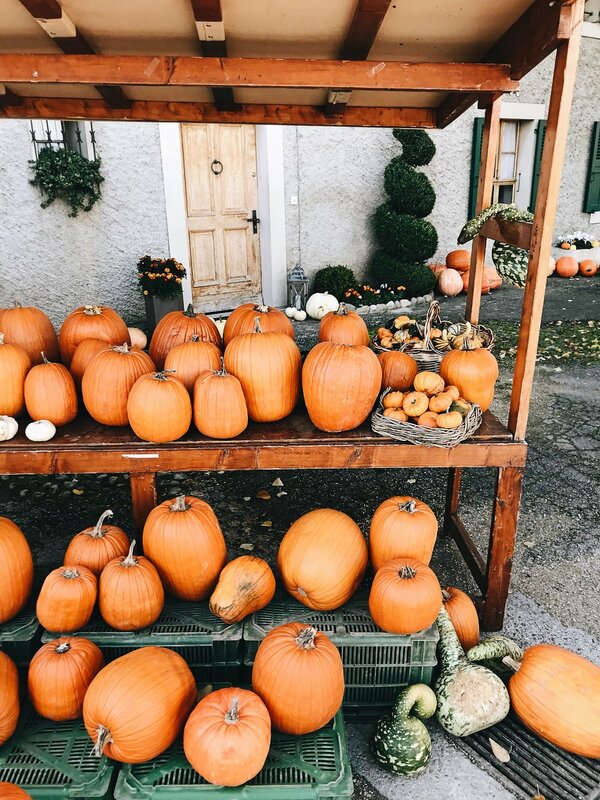 It's almost weird because I'm getting so over excited about everything that is Halloween and/or Christmas related such as pumpkins, decorations, glitters, Christmas trees, presents, snow, basically everything... I can be so annoying sometimes eheh. So I decided we needed to go to a pumpkin patch the other day so that I could pick some of them for the house decor. I was totally ready to get 10 of them but then realized I would have some issues storing them all in the apartment..yes, that's how festive I get. I finally chose a big orange "classic" one and some white babies, did I mention I loooove white ? Everything's white and beige at home so I thought it would match the interior pretty well. They all now sitting in the hallway looking cute (until they won't be anymore eheh). I also have this thing for food you know and when I saw they were selling Grittibänz mixes with all you needed to achieve the perfect little Grittibänz man.. Well I bought it all and decided it would be a baking night. I am usually quite good at cooking, not to brag but I watched my mother a lot when she was cooking for us and this always made me want to reproduce what she was doing. Since I'm living on my own, I finally got to put all those -in-the-kitchen-stalking-you-while-you-cook-and-I-eat hours to practice and see if I was also able to produce something 1/2 as good as she was doing. Results ? Well I still have a lot to learn obvy but I also was kind of proud because it wasn't bad at all. Enough about my childhood. Do you know the Grittibänz ? If you are a non-Swiss reader.. well you're probably thinking "WTF is she talking about ?! I can't even pronounce this weird word!". So it is a traditional brioche from Swiss-Germany mainly that is made around Christmas time for children. 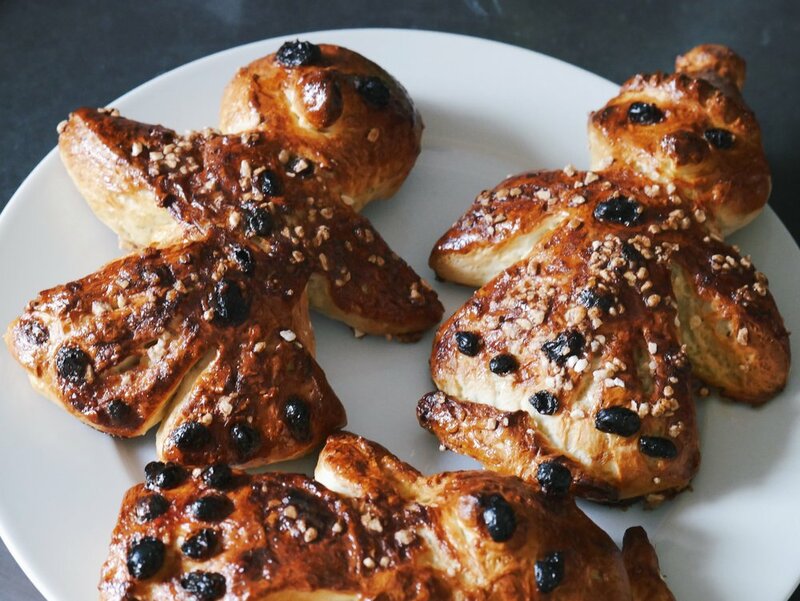 These brioches are shaped as cute little men that are decorated with dried grapes, big sugar bits and some almonds (optional). 1) First you need to put the whole package of the mix into a large bowl (very hard right ?). 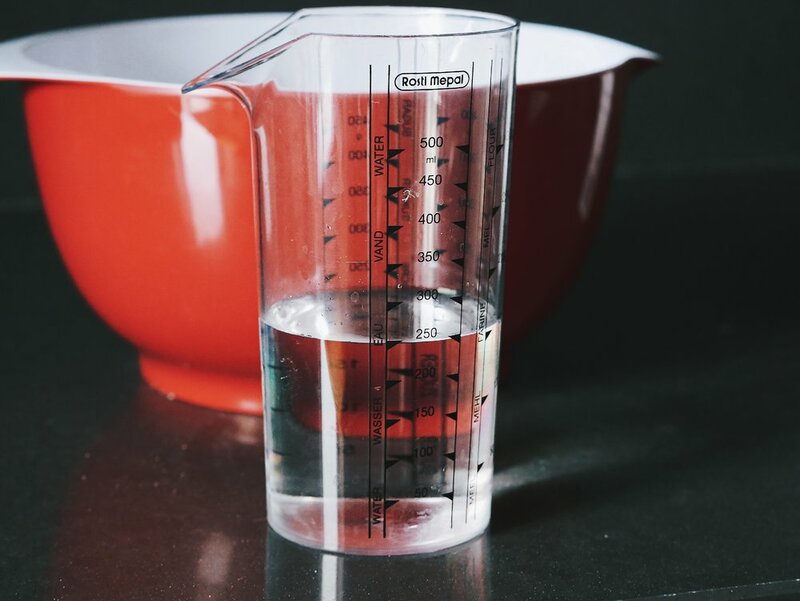 2) Then add the amount of water that is required (mine required 250ml). 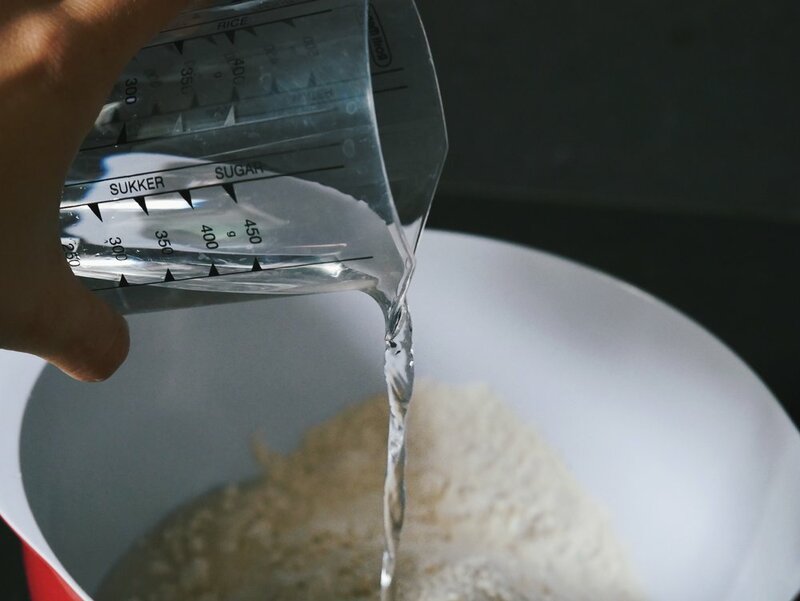 3) Mix the water and the dry ingredients together to form the dough. Mine was a little bit sticky and didn't look so good but I left it like this because I wasn't sure that adding water was the best idea..
4) Once the dough is formed, let it set for about 30 to 45mins. 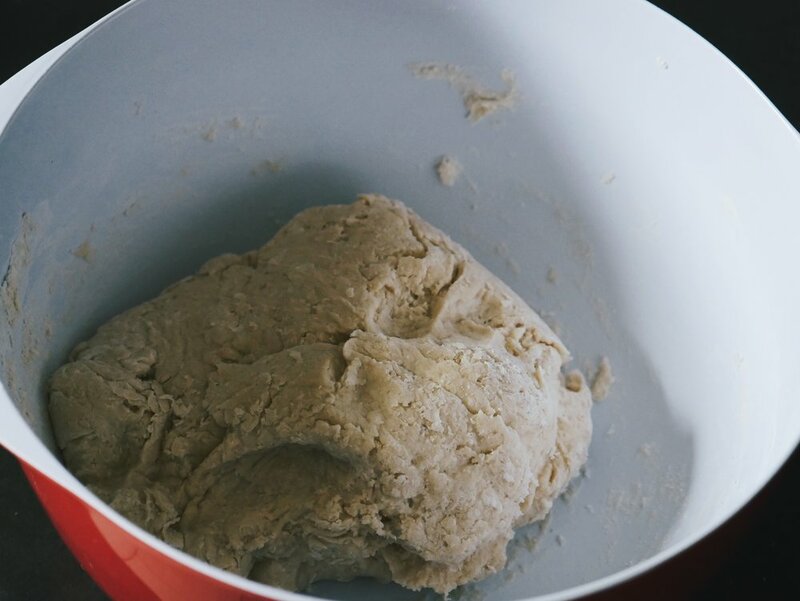 5) Form the little men with the dough. THIS is the tough part guys ! I wanted them to look as good as the ones on the package... No need to say it was not going to happen. They looked SO BAD ahah ! The dough actually has a weird texture that doesn't allow you to do much, so I used a knife and started to carve the details in the dough. 7) I used one egg (beaten) to cover the little men and added some of the granulated sugar all over them because I love the taste of it on a brioche. The egg made the sugar stick to the dough and it also makes it crispy. D-Day. But guess what ? They were absolutely delicious ! I recommend you to eat them with some tea and marmalade or even chocolate, tastes sooo good ! Especially when they are straight out the oven ! If you try to recreate them, please send me the picture via Snapchat (Eradyla) and/or Instagram ! xoxo. Nov 21 Apartment tour - Welcome to my crib !